If blogging is all about self-expression, why do so many blogs look so blah? Most free blog services offer only a handful of designs, giving you few options for personalizing your site. Most beginner "blahgs," it seems, are generated using free services whose customization options are meager at best. But you can break the monotony and supercharge your Weblog by installing your own blogging software and customizing it as you like. You'll control how your site looks and functions--and when you're finished, you'll have a distinctive-looking blog that you can easily update to keep it fresh and functional. Dozens of great blogging tools are available, and PC World has rated several of them. Among the most popular and versatile of these is WordPress. You can easily scale it to your needs, so it can handle a basic family blog or a professional blog or news site with equal aplomb. The latest version, WordPress 2.5, offers photo gallery support, powerful media management options, multiple file uploading, a new look, and more. And because it supports a host of plug-ins and widgets, you can quickly introduce additional features as needed. I'll explain how to get started with the installation, how to customize your blog, and how to create posts. If you just want to dabble with a free, hosted WordPress site, visit WordPress.com; But if you want to take full control of WordPress's powerful content management and site design features, including your own personal domain name, you'll need the WordPress software (note that the free software is available at WordPress.org, not at WordPress.com) and a Web hosting account to install it on. Using the WordPress software, you'll be able to adjust a multitude of settings to craft your own unique, easy-to-manage site. To get started with your WordPress blog, you'll need four or five basic things. A Web hosting account with PHP version 4.3 and MySQL version 4.0 or later enabled. 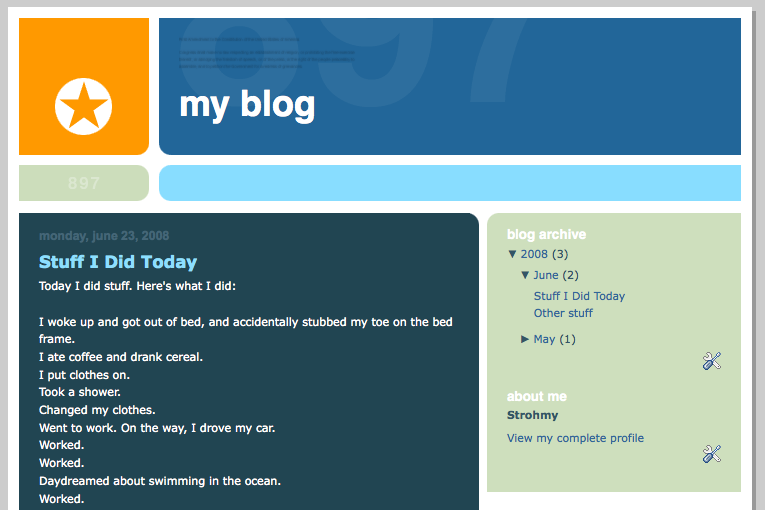 A MySQL database to store your blog's data in. You'll create this during the WordPress installation process. A text editor, such as Notepad (on Windows) or Text Edit (on the Mac). A simple text editor produces better results than a full-blown word processor such as Microsoft Word. An FTP client, such as FileZilla for Windows or CyberDuck for Mac, to simplify and accelerate the process of uploading the WordPress installation files to your hosting service. An image editor, though optional, can be very helpful if you want to create your own custom themes.&#160;One good, free option is The GIMP (that is, the GNU Image Manipulation Program), which includes many features that rival Adobe Photoshop provides, minus the price tag.